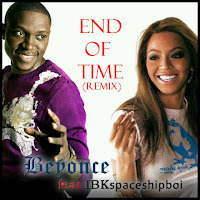 The winner of the donjazzy enigma beat competition is back and about to take on his next challenge which is the Beyonce "end of time" remix competition. His remix of this track can be defined as award winning awesomeness. check the link to listen, download and vote by clicking the like button at the top right of the screen for IBKspaceshipboi on this competition. He is our Nigerian representative. PLEASE VOTE TO TAKE IBK TO THE TOP! VOTE NOW TO PUT NIGERIA ON THE MAP.